A lure constructed of any material excluding "soft plastic bait" and "natural and scented bait" as defined in the wildlife code. Synthetic eggs, synthetic worms, synthetic grubs, and soft plastic lures. Lure fishing for trout doesn't exactly have much of a storied tradition to report on, but it sure is fun. The way to be successful fishing in this manner is fairly cut and dried. It starts with having the right equipment. Now, while a simple Zebco-style spincast outfit may work fine, they're not always very good at casting thin flimsy line, which is a necessity. Some of the pricier spincast reels do quite nicely, but a lightweight spinning reel with a medium action 6-foot rod is a better place to start for most fishermen. Some trout fishermen love the challenge of an ultra-light set-up, but this is not necessary. The smaller the reel, the smaller the crank ratio. The shorter the rod, the less shock absorber effect you'll have, meaning you'll have to use your drag setting and brains to avoid breaking the line. In other words, landing the fish is more difficult. Shorter rods also make it tougher to cast long distances. Regardless of the rod and reel you choose, you probably shouldn't use a line any thicker than 6 pound test -- just make sure you're using a good quality line, so it will be strong and flexible. Some believe that the trout actually can see heavier line, but this is simply not the case. Trout eyes have been thoroughly examined under a microscope, and human vision is actually 14 times more acute. And even if they could clearly see your fishing line under water, they're probably not smart enough to care. Instead it seems that they are most often spooked by the shadow cast by the contact point of the line ENTERING the water. Next time you're fishing in clear water, take a look. Your line moving around on the surface of the water will cast a BIG shadow on the bottom of the stream. Since sudden movement spook trout, it makes sense that you're chasing fish away. If you keep your rod tip down so the shadow is at your feet, you'll do fine. Obviously, the lure will represent something swimming in such a way as to trigger a trout to pursue and attempt to eat it. Perhaps the most popular option is the in-line spinner bait. A well-known example is the ever-popular Rooster Tail, but there are several other outstanding options offered under the names Blue Fox, Mepps and Panther Martin. For most Missouri streams, 1/8 oz and 1/16 oz sizes in a variety of colors will work well. In-line spinners are designed to imitate minnows and work best when retrieved in a straight line at a moderate speed. If you reel too slowly, the spinner won't spin properly, which often puts the trout off. The next lure on the menu are crankbaits. The classic Rapala Floating Minnow is one of most productive patterns of all time, but mini-cranks can also produce amazing results. Look for a plug that will imitate small shiners (silver), suckers (gold), or sunfish. The beauty of using a plug is that you can experiment in a wide variety of ways. You can buy floating, sinking or neutral buoyancy plugs to help you reach different depths. If the plug has a plastic lip jutting out and downward from the front of the lure, it will swim downward when you reel. So, floating lures will swim downward until you stop reeling them, at which point they will slowly begin to float back to the surface. When you stop reeling a neutral buoyancy plug, it won't float back to the surface, and it won't sink any further -- it stops dead in the water. Sinking plugs sink, of course. They sink face first when you reel and belly first when you stop. Other than these built-in perks, the action of the lure is totally up to you. Vary your retrieve from quick to painfully slow. A straight consistent retrieve works fine, but also experiment with jerky retrieves and start & stops. If you can convince the fish that the minnow is injured and weak, it will often trigger a strike. In-line spinners and crankbaits are the basic hardbody lures that represent little fish. With these lures, you'll catch hatchery fish, but you'll also catch mature fish that have grown large enough that they've acquired a taste for other fish and have started hunting rather than simply grazing on insects. You may occasionally find trout waters that do not have a sufficient population of aquatic insects to support the resident trout, other than teeny tiny "no see ums." In this case, trout will often take up a role higher up the food chain. The little fish eat the itty bitty bugs, and the trout focus on eating the little fish. These streams can be very frustrating for fly fishermen. Lure fishing these waters, however, can be an absolute blast. ​Marabou jigs (not Crappie jigs) will flat out catch trout if you know how to fish them. Many fishermen are under the mistaken assumption that marabou jigs imitate minnows, but they actually imitate the swimming action of certain large aquatic insects. by dancing up and down rather than side to side. 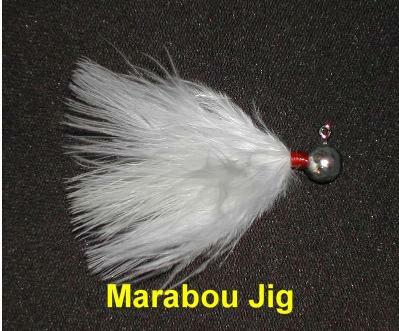 In fact, a marabou jig is technically a fly and can be used on waters designated as fly-fishing only. Even so, this lure is best fished with a spinning outfit. Trout and salmon appear to be programmed by nature to react to this motion almost without fail, so these lures will work even when the actual insects they imitate are not present. In fact, when marabou first became popular as a fly-tying material, some states actually considered outlawing its usage in some waters due to the massive success fishermen were having and how it actually depleted some trout and salmon populations. ​To achieve the proper effect, cast and allow the jig the sink for a few moments. Then retrieve the jig at a slow rate while simultaneously and rapidly twitching your rod tip up and down. Rapid twitching means RAPID twitching. Your rod hand should bounce down perhaps 4x per second while your retrieve hand is making no more than one revolution per second. Try counting "one-one-thou-sand, two-one-thou-sand..." and so on to establish the rhythm of your cranking while bouncing your rod hand on each syllable. It takes a little practice to get the feel of it. ​Many trout fishermen are jig fisherman exclusively and can't imagine why anyone would consider fishing any other way. And with the success they enjoy, it's hard to argue with them. Favorite jig colors are white, hot pink, and black & yellow mixed. There are also those that prefer to fish these jigs under a bobber or strike indicator, just giving the lure an occasional twitch. Using this method will work better with a smaller jig -- sometimes called micro jigs -- and fished very close to the bottom. This is basically nymph fishing with a spinning rod. Cast upstream, and allow the lure to drift back toward you, passing the jig by as many fish as possible. The last basic type of lure we'll look at here are soft plastics, which are actually banned in many Missouri trout waters managed for wild or trophy trout -- soft plastics cause a higher mortality rate in trout that are released. When a trout grabs most flies or lures, it recognizes right away that it doesn't feel natural and will try to dislodge it. When a trout grabs a soft plastic lure, however, it feels very natural. So, the trout's reaction is to try to toss it back and swallow it. For this reason, these lures are often very deeply hooked and are more likely to cause lethal damage to the fish. From a legal standpoint, the state of Missouri considers soft plastics to be member of the bait family, so anywhere you are permitted to fish with bait, you are also permitted to use soft plastics. Otherwise, they are off-limits. The favorites include twister tails, rubber shad and specialized rubber worms designed just for trout. These are all very simple to rig and use. A small white or black twister tail or plastic shad rigged on a jig head can be cast a good distance and retrieved in a straight line at a moderately slow speed with great success. The tails of these lures offer all the action you need to trigger a strike from a hatchery fish or even a big monster looking for protein power snack. You basically fish these lures just as you would a straight-line spinner. The plastic worm is fished differently, however. Some of these trout worms are made with a bend in their middle while others are manufactured in a straight tube form. This is to allow for distinctly different fishing methods. In either case, you'll use a small hook of size 12 or so with a small split shot sinker or two about 18" above. Method #1: bend the worm in half and push the hook directly through the bend to maintain a "V" shape to the lure. Cast the worm and allow it to sink to the bottom. Retrieve it slowly with a sharp twitch of the rod tip every second or two. The twitch will close the "V", while the pause immediately after allows the "V" to open back up, giving the worm a froggy appearance. If you get a bite, you'll probably set the hook automatically when you twitch it. Method #2: thread the worm onto the hook so the worm lies flat. The point of the hook should be just a bit exposed, and the eye of the hook should be hidden inside the worm. In a section of the stream with a rocky bottom and minimal vegetation, cast the worm and allow it to sink to the bottom. Retrieve it extremely, almost painfully, slowly without twitching. You will feel the weight of the rocks against the sinker from time to time, but just keep reeling slowly -- no jerking. The line will wrap around a rock and the worm will dangle downstream from the rock, appearing to swim upstream. Once the worm comes around the rock, it will be washed back downstream until the line again wraps around a rock. It will then begin swimming upstream again. So, the big picture is this. The worm swims up, flips down, swims up, flips down, and so on. It's truly neat. It's very important that you use small sinkers with this presentation. Larger sinkers will get hung up on the rocks. So if you need a lot of weight, it's better to use a line of small sinkers. It's also important that you use a heavier line, since the rocks will wear on the line due to friction. A flourocarbon leader would come in handy, for that reason. Method #3: rig the worm as in method #2, above. Cast into a deep pool with a slow current. Again reel the worm in slowly. Keep your rod tip up and try to keep an eye on the worm. Every couple of seconds, give the worm a few twitches with the rod tip. If you can see the worm as you reel it in, you'll begin to grasp how alive these things can look with just a little twitch here and there. Experiment with the action to achieve the "swimmiest" look you can. Here's the kicker on this one. This retrieve will get every fish's attention in the stream. At some point, a fish will grab the worm and try to run away with it hanging from the corner of his mouth. Instantaneously, every other fish in the river will want that worm. So, if you attempt to set the hook and instead pull the worm out of the fish's mouth, let the worm sit right there without a move for a couple of seconds. Very often, another fish will viciously attack it. Very exciting. You can catch trout in all types of water using these lures and techniques, but aggressively feeding trout will tend to be found in the pools and channels immediately downstream from riffles, so start there! You'll also find ambush-feeding trout around root wads and undercut banks -- always worth a look.